Experts from Europa Nostra, the leading heritage organisation in Europe, and the European Investment Bank Institute will arrive tomorrow in Bulgaria for a three-day mission to the Buzludzha Monument. The building was listed among the 7 Most Endangered heritage sites in Europe in 2018, following a nomination made by the Buzludzha Project Foundation. The European delegation of heritage and financial specialists will meet with local and national authorities and stakeholders, including representatives from the Ministry of Culture and the Ministry of Regional Development, with the aim of mobilising efforts towards saving this imposing example of 20th-century architecture. The key findings and recommendations of the mission will be published in a report by the end of 2018/beginning of 2019. Media professionals are invited to join the visit of the experts to the Buzludzha Monument on 27 September at 11:30am and also the concluding session of the mission at the hall of the regional administration of Stara Zagora on the same day at 4:00 pm. During the concluding session, the experts will state the purpose of the 7 Most Endangered programme and the roles played by Europa Nostra and the European Investment Bank Institute, particularly in relation to the mission to the Buzludzha Monument. Dora Ivanova, Architect and Director of the Buzludzha Project Foundation will present an update regarding the concept for the preservation of the monument. The regional governor Mrs Mikova will discuss future plans for the site and speak about the support that is already existing. The programme of the mission includes meetings with local and national stakeholders in Stara Zagora and Sofia on 26, 27 and 28 September. Graham Bell (architect, project manager and educator, from the United Kingdom): Board Member of Europa Nostra; UK national coordinator for 2018 European Year of Cultural Heritage. As Director of the North of England Civic Trust (NECT), he leads a project organisation that has rescued and reused properties ranging from a neo-classical country house to a former town hall and Victorian model farm. His expertise is shared through business planning and project management with other NGOs. He is on the executive of the European Federation for Architectural Heritage Skills (FEMP) and is a longstanding specialist adviser to the UK National Trust. Laurent Lévi-Strauss (PhD in Sociology, from France): Board Member of Europa Nostra; former Deputy Director of the Division of Cultural Heritage at UNESCO for 15 years; former Deputy Director of the French National Academy of Fine Arts (Ecole Nationale Supérieure des Beaux-Arts) at the French Ministry of Culture. Mario Aymerich (engineer, professor in Transport Planning and Economics, from Spain): Technical Consultants contracted by the European Investment Bank Institute; former Director of the Environment and Regional Development Department of the European Investment Bank; former Managerial Advisor to the Director General of the Projects Directorate of the European Investment Bank. The Buzludzha Monument is a masterpiece of architecture, engineering and art. The unique structure was built in 1981 as the House-Monument of the Bulgarian Communist Party. 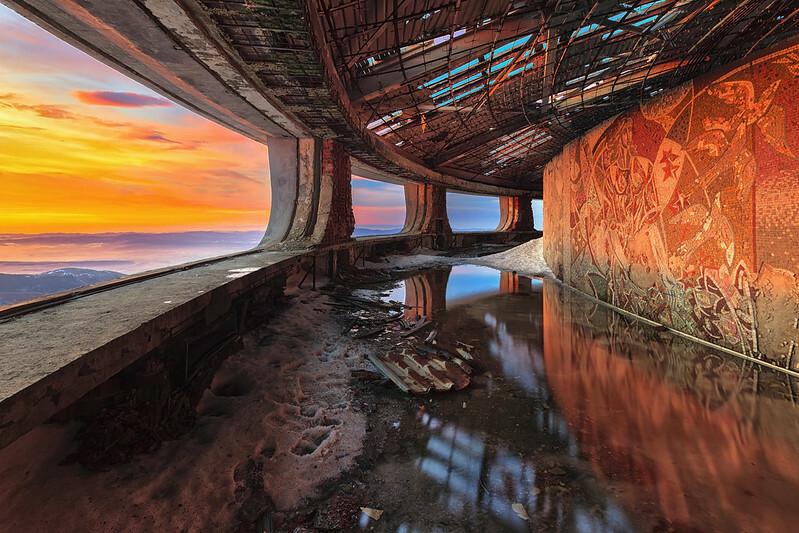 The structure was used for just 8 years until the end of the Communist regime in Bulgaria in 1989. Soon after the end of the regime, the Buzludzha Monument was abandoned and has since been victim to thefts, vandalism and severe weather conditions. The building still attracts attention thanks to its gravity-defying architecture and its colourful mosaics which cover 1,000m² of the building’s interior. Its spherical body, 60m across with 20m overhangs, symbolises a wreath commemorating the historical events which happened there, while the 70m tower represents a flag, decorated with the world’s largest illuminated stars. A total of 70,000 tons of concrete, 3,000 tons of reinforced steel and 40 tons of gilded glass were used. Today despite efforts to preserve the building, it is still crumbling and highly endangered. For more information about the programme of the mission, please contact Dora Ivanova.